Whether you are planning to have an intimate wedding or an exorbitant one, Shree Gurjar Sutar Vishwakarma Baug will surely match your unique choice, budget, and requirements. With a capacity of accommodating up to 350 in seating and 800 in floating, the venue has a cosy and comfortable interior for the guests. It also offers an in-house team of caterers that puts all the efforts to delight the guests with mouth watering multi-cuisine dishes. Shree Gurjar Sutar Vishwakarma Baug, Vile Parle West, Mumbai is located near Vile Parle Railway Station, offers a capacious and articulately-designed for hosting a wedding ceremony. It serves pure vegetarian delicious food and offers ample car parking space to their guests for their convenience. The decor team at Vishwakarma Hall takes care of the decoration for your big day. The elegant decor of the venue makes it an ideal option for a grand wedding. 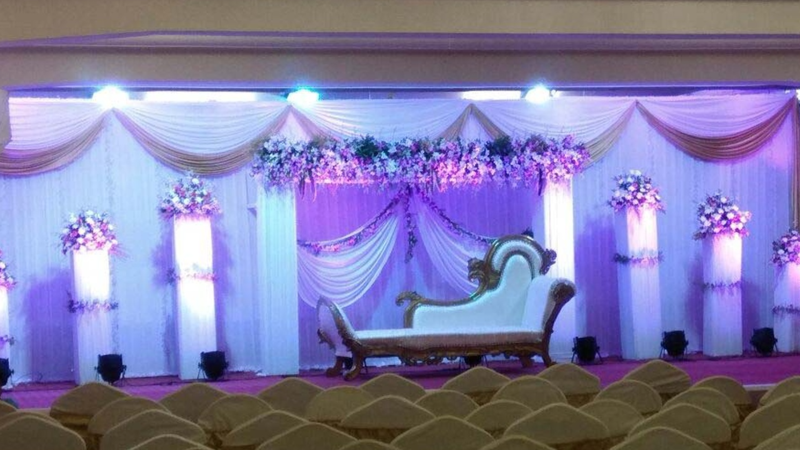 The floral decorations and lighting done at the entrance and on the stage will entice all your guests. The venue is also ideal for hosting your reception ceremony and the banquet halls can accommodate a huge crowd for your function. Your search for an overnight wedding venue ends here with Shree Gurjar Sutar Vishwakarma Baug, Vile Parle West, Mumbai which provides banquet halls with meticulously done interiors, lending luxury and comfort to the venue.